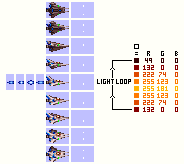 I've started with Gradius Gaiden sprites as they have lots of details and are still pixel based. My 8 way movement GML script also stops you flying off the edges of the screen. This script has the ship flying at one speed only (5 pixels). This script pans the ship up and down when the Up or Down keys are pressed. This script cycles the light colours through the 8 frames and also pans the lights animation with the ship when you fly up and down. The flame has four frames of animation and should be at the back of the ship. Working but not quite happy with it.